This course is designed for individuals of all skill levels, ranging from a total beginner to an experienced artist! 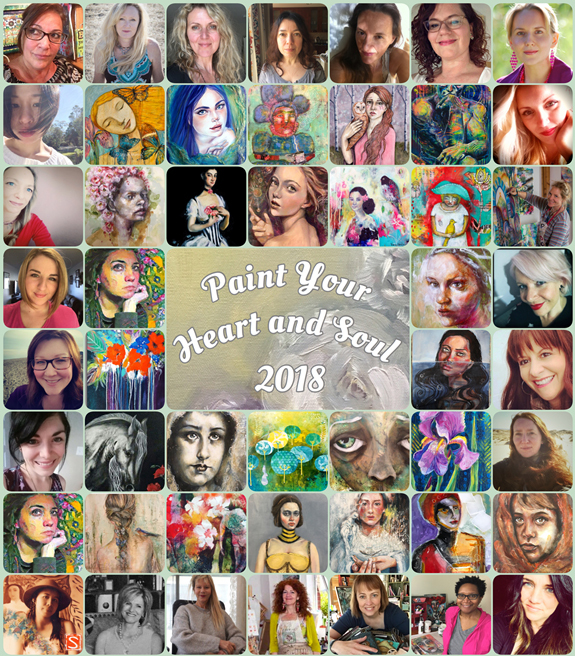 Click HERE https://tinyurl.com/y8uwrb8r to find out more about PAINT YOUR HEART AND SOUL 2018. This course is now open for registration, and if you register by December 1st, you can purchase the course at a DISCOUNTED PRICE! Don’t miss this out! Comment where you shared it, below. Already like on facebook, liked on instagram. So happy you rein PYHaS again! I shared on twitter, @keystoneflora. Thank you! I love your art and would be very happy to see your ney lesson. So glad to see you're teaching again. Shared on fb , pinterest, liked your instagram. Thanks for the opportunity! Hello Kate! I shared the link on my personal Facebook page (Karren Case). I have taken some of your older classes and am currently in your Fancy Lassies class.. so I already follow you as much as possible! I have shared your link on Google+ and Twitter. :-) I also pinned it on Pinterest. I liked your Facebook page and on Instagram. Liked your FB page and followed on Instagram. Shared on Twitter and Google+. Thank you so much for the opportunity! Had already liked your fb and instagram. Shared on fb twice, instagram once. Thanks for the opportunity....love all your classes! I've been following your TH & Instagram accounts for a little while. Have shaded your post on my personal Facebook account & on my art one - Peonygirl Art. Plus have shared on my Pinterest page Joelene Mitchell. Wow, beautiful!! I have shared on Facebook, Follow you on facebook (friends already), follow on Instagram and pinterest. I sure would love to win this glass what a treasure. Much wonder wishes to you. I have taken ALL your classes....would love to win this. Shared everywhere I could. Wish me luck! Shared on Facebook and liked your fb-page, already following on instagram .